Video: MellowHigh - "Troublesome 2013"
I'm sure we are all aware this past Saturday was the smokers holiday of 4/20 and a new track/video from Odd Future duo Hodgy Beats and Domo Genesis aka MellowHigh called "Troublesome 2013" was released. 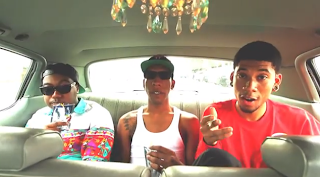 Also featured in the track is the other OF member and producer Left Brain, which together this trio brought the perfect smoked-out track to fans. The song overall has been some of their best work with Left Brain creating a funky-smooth beat, and Hodgy and Domo bringing the tight flows. And with the visual is them getting ripped in the back of a car while they spit their verses. Watch below and stay tuned for upcoming projects.